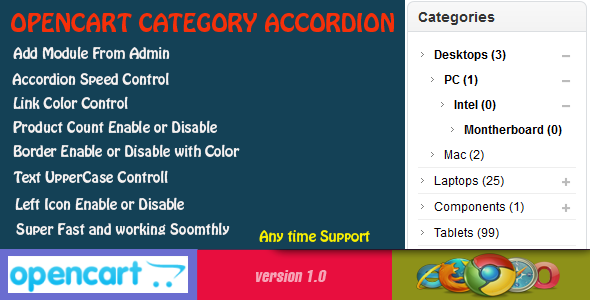 “Opencart Category Accordion Module” is the best module for opencart, it help to show all category list into collapsible accordion menu and easy for customer to browse any product category and how many product there. It is compatible for opencart version 1.5.3.1, 1.5.4, 1.5.4.1, 1.5.5.1, 1.5.6, 1.5.6.1, 1.5.6.2, 1.5.6.3, 1.5.6.4 and older version also. Admin can controll module from module settings tab. Add module any page using opencart default style. This entry was posted in Uncategorized and tagged accordion, accordion category menu, category, category menu, category menu module, collapsible, database, expand, expandable, feeds, forms, left menu, media, menu, multi category menu, php, right menu, scripts, sliders, toggle category menu, toggle menu, vertical menu by Acty. Bookmark the permalink.